We are happy to announce the onboarding of a new dealer - Stormer Hobbies. Bob Stormer and company have decided to bring on the Awesomatix product line -- and they are currently ramping up their inventory levels. In stock right now are A700 Evo kits, and various parts/pieces. In less than a week they will have many other option parts available too. 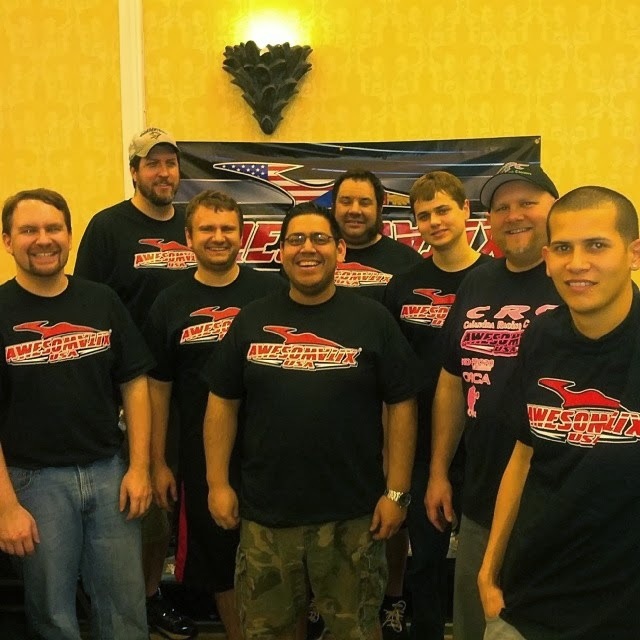 Awesomatix USA is proud to announce they are one of the sponsors of the 2014 ROAR Carpet Nationals taking place this weekend at HobbyTown USA HobbyPlex in Omaha, Nebraska. We'd like to wish our team drivers and customers the best of luck. If any Awesomatix runners have issues and need parts please make sure to see Brent Klingforth who will be managing any track side parts needs. Get ready for summer with Raceberry! Awesomatix USA is bringing in the asphalt killing Raceberry chassis for the A700 Evo. After consulting with Freddy Sudoff (Awesomatix EU) and Bernd Wellerdiek (Raceberry) we believe the Raceberry "hard" 2.1mm chassis in the Sudoff design that will be a hit this summer. The first run of chassis are expected to be available after the 3rd round of the ETS series (mid-March) just in time for the start of the outdoor season kicking off with the Worlds Warmup the first week of April. We are now taking back orders for these chassis. The 2014 Snowbird Nationals was the 20th running of this event held in Orlando, Florida. Snowbirds features nearly 24 hours of racing excitement with both on-road and oval classes sharing the track during a 24 hour period. On-road racing starts early at Snowbirds, with 4am open practice. Team Awesomatix USA was proud to sponsor this year's Snowbird Nationals allowing everyone to get a good look at our new products from the Evo to 2mm Alloy Chassis. In the largest class - 17.5 TC - with over 70 entires, Larry Fairtrace would TQ the tight field during round 3 - but he did so with a different car brand. For round 4 Larry would run his A700 Evo for the first time in 17.5 (this is his 13.5 race car) and just miss re-setting TQ by 0.071 seconds. Hot on Larry's heels in each round was Cory Parson in the XRay. The TOP 11 after four rounds of qualifying featured four Awesomatix TCs -- but with the famous Snowbirds B-Screw, Brian Wynn was forced to run the B-Main in order make the show. During the B-Main Brian would not be so lucky, and that allowed Karl Hoffmeister to drive to the win, and find his way into 10th place in the A-Main. The 17.5 TC A-main was uneventful for Larry as he shot out to a quick lead over Cory. After a minute Cory would crash sending himself off track and allowing Eric Anderson to move into the 2nd spot. Corey would drive hard through the pack back to finish 3rd. os Driver Car # Laps Time Fast Behind Qual # Consistency Std. Dev. "Round 4 was the first pack of 17.5 I had run on that car. And with no warm up laps being instituted I was not familiar with what the car was going to do with the 17.5 so my first couple laps were slow. Had I gotten any practice with the car in 17.5 prior to that round I would of for sure gone faster than my Tq. .071 difference and zero laps on that car in stock all weekend up to that point. I ran the Shaft car on Sunday (mains day) because I tried them both in the morning and the track was slightly changed and the Awesomatix was absolutely amazing on Sunday and clearly the correct choice for both classes (17.5 and 13.5). It was one of the best cars I have ever driven on Sunday. Plus I thought the super free drive train could take another tooth and I wanted to get out to a lead and then cruise. My plan worked." In USVTA, Dave Johnson (VBC) would TQ over Dave Ehrlich (VBC) and Jim Piersol (XRay). In the A-main Michael Hanulec (Awesomatix) would steal the win from the rest of the field crusing to win over Dave Ehrlich and Jim Piersol. Pos Driver Car # Laps Time Fast Behind Qual # Consistency Std. Dev. In modified Paul Lemieux (XRay) would TQ over Marc Fischer (Serpent) and Keven Hebert (Associated). Going into the A-main, Josh Cyrul, starting 8th on the grid, would have a rocket start upto 4th place by the 2nd lap. He would get as high as 3rd overall before making a mistake and falling back to 5th. He finished the 5 minute race 4th overall. Throughout qualifying of the 13.5T class, the trio of Keven Hebert, Cory Parsons and Larry Fairtrace would battle for the TQ over the four rounds. The TOP 11 after four rounds of qualifying featured two Awesomatix TCs -- but with the famous Snowbirds B-Screw, Karl Hoffmeister was forced to run the B-Main in order make the show. During the B-Main Karl would not be so lucky, and that allowed Paul Ciccarello to drive to the win, and find his way into 10th place in the A-Main. The 13.5 TC A-main was action packed as Larry would challenge Cory not once, but twice for 2nd place putting two fantastic passes on Cory before a 1 cent e-clip would side line Larry's car. Keven would run uncontested and only on the last lap would Cory lose 2nd place to his XRay teammate Chris Adams coming from 6th to take 2nd. Finally, and most importantly, the ever growing Team Awesomatix USA made a strong showing at the 2014 Snowbirds. We'd like to thank Mike Boylan and his entire race crew for putting on a great show. We will be back next year -- watch out!